Listen to the wolf howl in the devil’s graveyard, where ghouls and mummies await you on this 5 reel slot spookfest - check out the slots here. 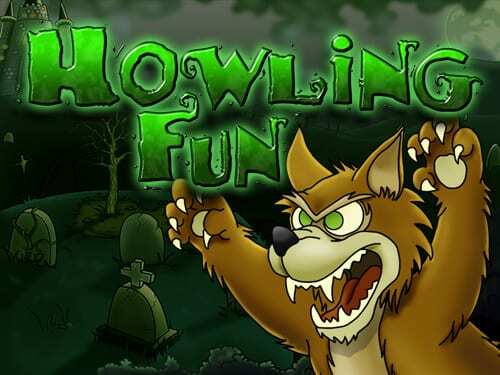 Howling Fun is full of surprises, as you enter the graveyard lookout for the devil’s challenge or be rewarded in Dracula’s castle with 15 free games. This online slot will have you scared stiff. Brisbane Australia developers Eyecon are known not only for their deep rooted passion for creating unforgettable online experiences, but also the ways in which they push themselves forward within an industry that has thousands upon thousands of pre-existent titles. We love their games here at WizardSlots and we think you will too. The search for new players' best new slots to play is over! 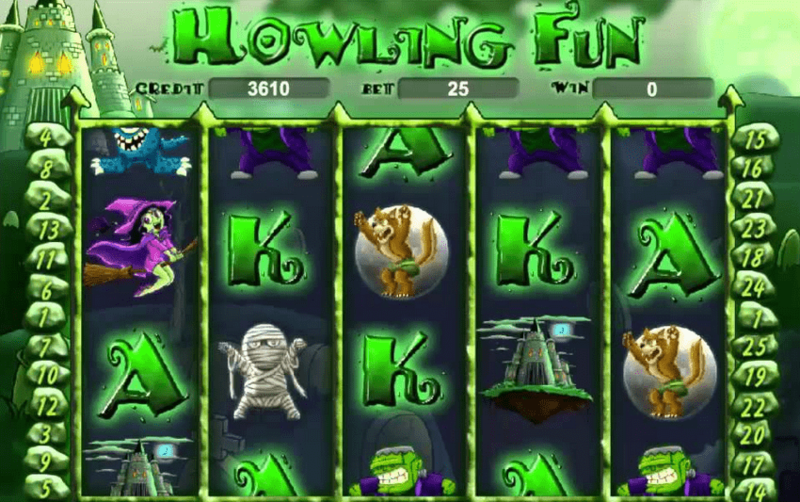 Howling Fun sounds like the perfect name for a Halloween themed online slot game does it not? Well, you’re right in thinking that the only difference is this game can be played no matter the occasion and setting. This 5 reel, 25 payline slot from Eyecon features witches, monsters, vampires and the like all in a bid to be matched by you the player, with the chance to win some rather spooky cash prizes. Trick or treat? Treat? Okay, slots include double wild pay-outs, up to 400 free spins with any 2x multiplier and bets can start anywhere from 25p to £12.50 per round, perfect for those who maybe just want to get a few trial runs in before they begin betting at a higher stake. Eyecon made the choice to create some very creepy characters that are sure to make your skin crawl, with the game taking place atop a creepy castle on a very haunted hill. The reels themselves have a terrifying green mist pulsating through each of the symbols as if they are powered by the creature in each section. There is then, of course, the traditional A and K symbols as well as the ragtag group of creatures that serve as symbols of the game; very immersive and very fun. Land 5 of the Frankenstein monsters to conjure a 1,000 coin payout. Your highest payout will come from the rather dapper Count Dracula, with a chance at winning a maximum of 5,000 coins should you align the maximum of 5. On top of the traditional gameplay, you have Howling Fun’s feature rounds. Landing 3 or more of the mummy scatter will trigger the prize pick feature, each mummy matched will award a selection in the bonus round. Bonus round prizes can multiply your bet up to 100x your original stake! Look out for the castle symbols, land 3 or more of these symbols to be rewarded with bonus free games. The best thing about these free games is that all payouts from the free games won will double all payouts! Never has such a scary online slot been so appealing. This is your classic Eyecon game, a very self-contained game that isn't afraid to be silly — which for this kind of game is a very welcome addition. If you enjoy cheesy horror flicks you will more than likely love this game.